New for 2015, NBI Drainboard Sinks has added a sixth design to its fast-growing lineup of midcentury reproduction drainboard sinks. This new design option measures 60″ wide. 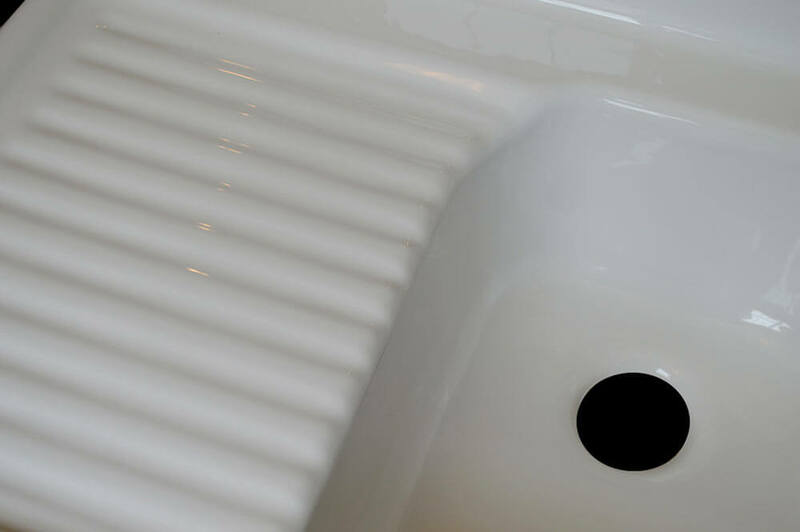 Like NBI Drainboard’s other sink choices, this model is available in 6 different colors and has the option of adding additional holes for faucets with sprayers. Depending on which options you choose, the price ranges from $899 – $929. An untouched reproduction of a classic mid-century design. This eye catching, beautiful design reflects all of the original features of its mid-century counterpart. This model offers dual basins that are flanked spaciously by twin fluted drainboards and a beautifully integrated and mitered back-splash. The overall combined basin dimensions allow this model to fit easily into smaller modular sink base cabinets without modifications. Both drain holes are drilled to a standard 3.5″ diameter and are waste disposal system compatible. Manufactured in-house from durable reinforced premium Bio-Lok™ cast acrylic, this reproduction achieves excellent durability and ease of care while maintaining an authentic vintage style. Quality assured by our five year manufacturers warranty and your satisfaction guaranteed or your money back per our 30 day return policy. Left and right side drain boards. 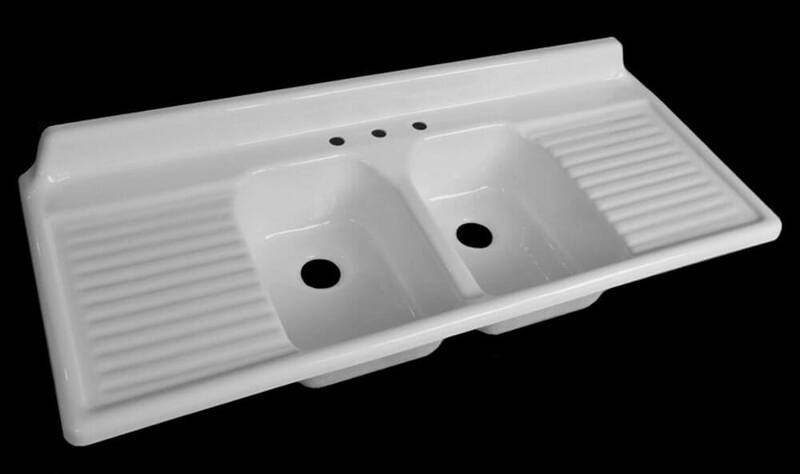 Overall dimensions: 60″ length (side to side) X 24.5″ width (front to back) x 5.5″ H (from bottom of flange to the top of backsplash, 12″ when including the sink basins. 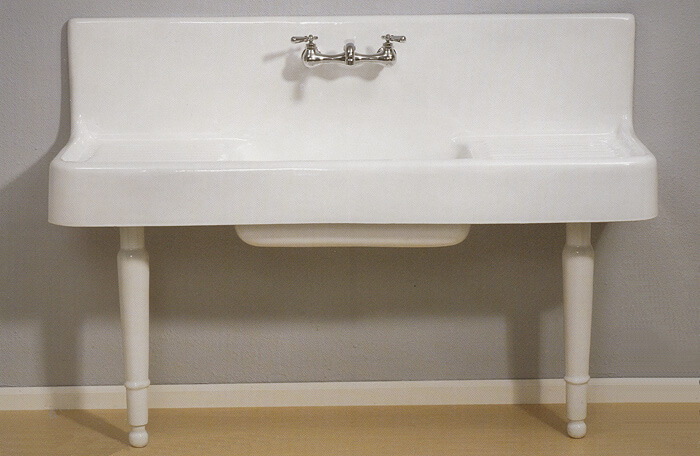 Each basin measures 13.5″ long (side to side) X 17.5″ W (front to back) X 7.25″ deep. Combined basin width is approximately 29″ L (side to side) X 17.5″ W (front to back). 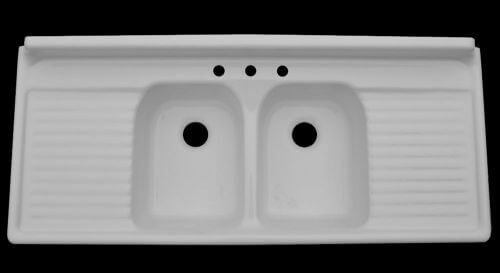 It is great to have so many sink styles and sizes available for a replacement sink or to use in designing a vintage-style kitchen. 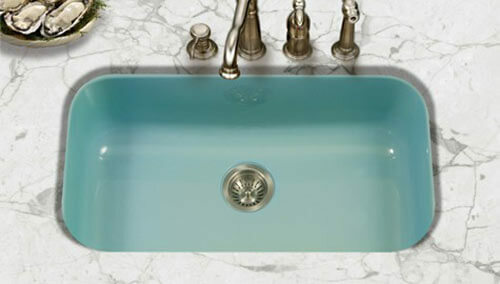 Porcelain enamel kitchen sinks in 3 styles, 8 colors — including aqua! Great looking sink! Now if they would just expand to colors! Pink, Ming Green, and Yellow! That was my thought exactly Tami – more colors! One of the catalogs Pam posted a couple of years ago included a sink in “Melon.” I’ve been looking for that color ever since. Must be a real rarity. Pam – didn’t there used to be a link to your catalog collection? no yellow! I have a double brain board sink. In yellow ro match my Chambers range. So still considering re-porcelaining it. Who no mid mid colors? Also, we who love the colors might still be a small part of the market. Looks like my farmhouse sink from 1905. Except mine is cast iron coated with porcelain. I think shipping would make these ‘cost prohibitive’ if they were re-made out of cast iron/porcelain. 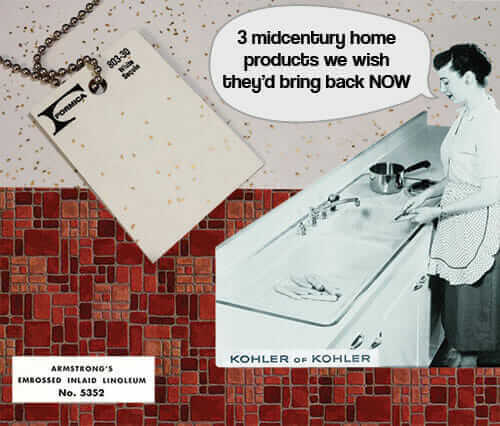 This is a Great option for those of us who want the old look of a vintage kitchen. Thanks for the source Pam. We have this sink except ours is bigger and deeper. It is original not a reproduction. Not sure where we are going to use it, it is to big to use in a little cottage that we are redoing that was built in 1945. We might use it in the laundry room. It is cast iron and weighs a ton. Lucky YOU! If you ever change your mind & want to get rid of that ‘big old heavy thing’… lol (kidding) I’m sure it will look great in you 1945 restoration. Originals are the Best! 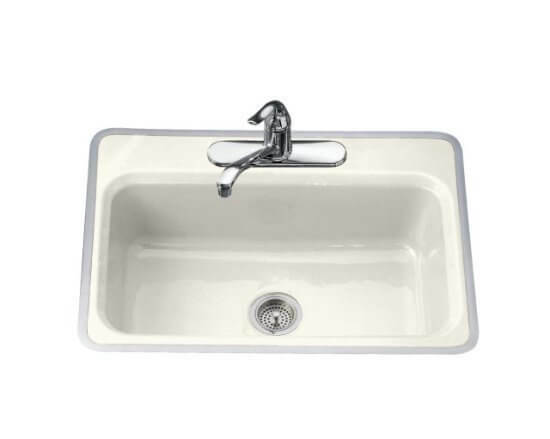 The rest of us are happy to have these great options in old sink styles available. Thanks Pam. These will not work if you are keeping your original vintage cabinets. Most cabinets made prior to late 50s are shallow ( from 20 – 22 inches ). These sinks require a cabinet of at least 24 inches to be installed within the counter top. Make sure to measure the depth of your counter top before you order this. I wanted to use one of these sinks but it was not an option unless I rebuilt my lower cabinets. I ended up installing an Apron sink that fit and looks good. If you can install one of these go for it they are great . It is not true to say these will not work on original vintage cabinets. My vintage cabinets [steel Geneva’s] are 24″ deep. It may be that other pre-war cabinets are also that deep.